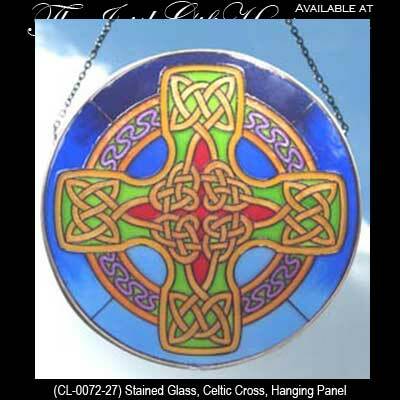 This stained glass suncatcher depicts an ancient Irish Celtic cross. Celtic crosses are found throughout Ireland on old monastic sites; the earliest designs were made from wood or metal but the great stone monuments date from the 9th century. This stained glass Celtic cross suncatcher features a knot-work motif and measures 6 1/2" in diameter. The Irish suncatcher is enhanced with a metal frame and includes a metal chain for hanging. The colorful Celtic stained glass suncatcher is made in Ireland by Clara and is gift boxed with Celtic cross and Celtic knot history cards, complements of The Irish Gift House.